This is why I love the Internet (besides the fact that you can use words to link to things in blog posts, as I have done to excess in the next sentence): a very friendly and talented author/illustrator named Jonathan Auxier sent me an email and told me that he had, as part of some Photoshopping practice, created a digital painting based on the quotes in my last blog post about the "Library of the Future" kid's essay contest. 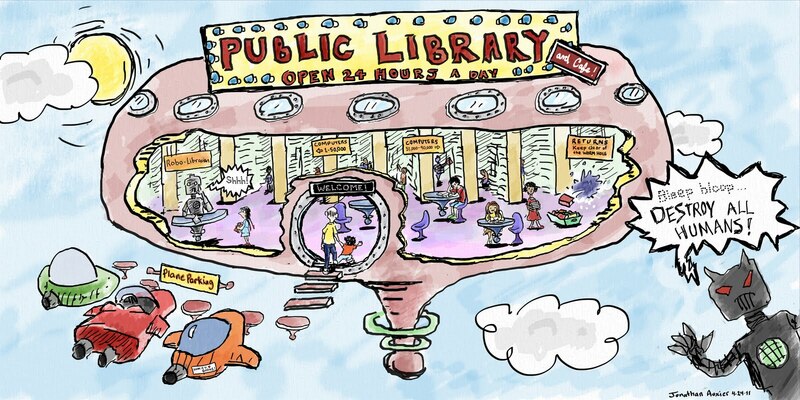 He even included plane parking, the purple chairs, the 90,000 computers, and my personal favorite, those darn robot librarians. Amazing! Thank you, Jonathan! I want to visit that library! Can we make reservations today? I'm sure the planes will be booked far into the future. So which comes first.. 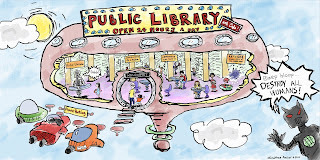 The flying cars or the levitating library? I'm still waiting for jet packs to be perfected. What Do Kids Want to Read?